PIMCO: As the global economy recovers, it is likely that the 2008 surge in the net U.S. international liabilities will put downward pressure on the dollar for some time to come. In a post-crisis world the relative attractiveness of U.S. assets has and will likely continue to decline, and global investors may seek to rebalance away from the 60% increase in their net exposure to U.S. assets that occurred in 2008. This is negative for the dollar and, in the New Normal, also likely negative for the relative performance of U.S. equities, especially for companies without a global presence that must grind out profits in a world of 4% nominal GDP growth. This is the standard, well accepted doctrine these days, particularly as the dollar continues on it's downward path. But if one digs a bit deeper, the level of certainty about continued dollar weakness becomes less pronounced. With the dollar paying nearly nothing, it makes it a great candidate for the carry trade. Shorting the dollar is becoming everyone's favorite pastime (including retail investors). That trade is however quite vulnerable to rate increases. Some folks from Barclays published a paper (see attached) that argues that dollar will strengthen next year as US rates increase. 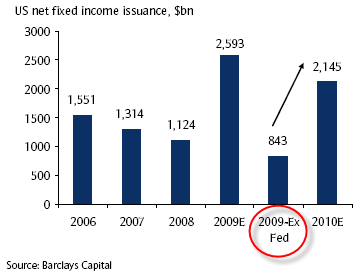 The chart below shows that in spite of record fixed income issuance in the US (particularly treasuries), the Fed has absorbed a large portion of that new paper. This low net supply resulted in continuing demand for US fixed income product, keeping rates low and dollar weak (in addition to the Fed keeping overnight rates near zero). As the Fed slows down it's purchases next year, Barclays argues that the net supply of fixed income paper will rise sharply (chart above) putting upward pressure on rates. This in turn will reduce the dollar's appeal as the base currency for the carry trade (borrowing dollars will no longer be "free"). That may in turn stabilize the dollar (particularly a sharp carry unwind). Andrew Bary (BARRON'S, Oct 19th): IT'S TIME FOR THE FEDERAL RESERVE TO STOP talking about an "exit strategy" and to start implementing one. * Euro ? - just another fiat currency, like the dollar, but worse: backed by 800,000 Brussels bureaucrats. It's not a "real" economy and putative political will. * Yen ? -- neither the Japanese nor world are comfortable with Yen as reserve currency. * "Exotic" currencies ? -- [Australian, Canadian, New Zealand $, Scandinavian, etc], too small. * BRIC currencies ? -- illiquid markets and carry political risk... anyone trust Russia ? Brazil and hyperinflation history ? ... perhaps some decades/generations ahead after political issues resolved, China and/or ... India ? * Sterling and Swiss Franc -- before they were "big" alternatives to USD, DEM, but now "too small" relative to USD and Euro. So before plowing wholeheartedly into that short dollar trade, just remember that it sometimes pays to be a contrarian.